Much of what we now know about ancient Mayan government came from the ancient manuscript called Chilam Balam. Most scholars believe that the Books of Chilam Balam were directly translated from ancient Mayan hieroglyphic codices. According to these codices the Yucatan Peninsula was governed for almost two hundred years by the “Triple Alliance.” The Triple Alliance consisted of the three most important cities in the Mayan realm. They were Mayapan, Chichen Itza, and Uxmal. The Alliance existed between the years of 987AD and 1185AD. The lords of these three cities held the reigns of government over the entire Yucatan Peninsula. We also know that these three centers did not flourish simultaneously, and that originally Chichen Itza was the most important center. Then sometime around 1200AD, Mayapan emerged as the capital and most important city. From the Book of Chilam Balam we also learn a fascinating story about how Mayapan became the capital of the Yucatan Mayan Empire. For reasons that are still unknown, a powerful lord of Mayapan named Hunac Ceel, during a human sacrifice ceremony, threw himself into the Sacred Cenote (a spring in Chichen Itza that was used for human sacrifice). All of the previous victims had drowned, never to be heard from again. To everyone's surprise Hunan Ceel reappeared from the depths of the pool claiming to have personally talked to the gods. 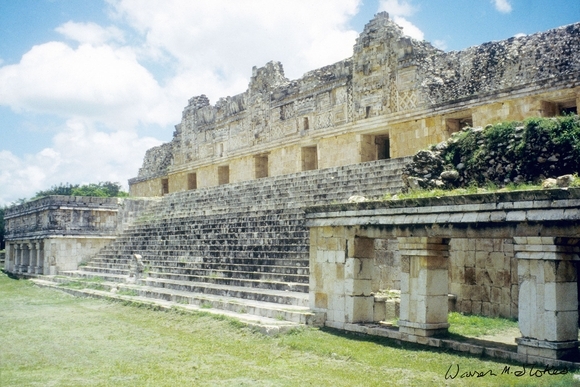 According to legend, at this time he became the Mayan ruler and subsequently moved the Mayan capital to Mayapan. He also declared war against the ruler of Chichen Itza named Chac Xib Chac. From then on all chiefs were forced to lived inside the walled city of Mayapan. Then to further enforce his rule, Hunan Ceel recruited professional soldiers from the Mexican state of Tabasco. These mercenaries were known as the Ah Canul, and they fought for a share of the spoils. Hunan Ceel and his descendants maintained control over the northern part of the peninsula for 250 years. By the time the Spanish conquistadors had arrived the Mayan Empire had been in decline for a few centuries. The Spaniards found the Yucatan divided into 19 sectors, with each one controlled by an individual cacique. The cacique or chief was called Halach Uinic which means “he who reigns”. He carried the tile “Ahau” which meant king. This position was hereditary and usually was passed to the oldest or most competent son. If there were no sons then a council would usually elect one of the closest relatives to the post. Under the Ahua were the Batabes who governed the areas outside of the city. The Batabes administrated all of the business of the area. He served as judge, tax collector, executive, priest, and head of the military. He was also in charge of the distribution of land, and how it was cultivated. Under the Batabes were the Ah Cuch Cabes who were like the city councilmen of today. The Ah Cuch Cabes helped the Batabes in administrative duties. Under the Ah Cuch Cabes were a variety of assistants who were titled either Ah Kuhles, Holpopes, or Tupiles. Mostly, these people, consisting of mainly of civil servants, carried out the orders of their superiors.